You do have to wonder sometimes who’s making the judgment calls in our newsrooms. Last night One News decided to use a National Party staffer, David Farrar, to comment on a poll that showed the Maori Party leading Labour in the Maori seats. As you’ll see in the picture, Farrar was introduced as an independent ‘political commentator’. Not once during the segment, which involved criticism of the government, were Farrar’s party political biases revealed. This for a man who is on the National Party’s payroll, runs a pro-National blog from their headquarters, spent years working for the party in Parliament and is a life member of the Young Nats. David Farrar is a political operative, and he’s National Party to the bone. He’s certainly not an independent commentator. That it’s come to this is no indictment on Farrar personally. He’s spent years building up Kiwiblog as the National Party’s online messaging hub, and judging by its popularity and influence he’s done a bloody good job of it too. You can hardly blame the guy for taking advantage of an opportunity to do the same thing in the mainstream media under the guise of independent commentary. The real fault lies with media outlets that should know better. One News isn’t the only guilty party here – Farrar is regularly trotted out as an independent ‘commentator’ on Newstalk ZB, Good Morning and the Herald on Sunday, among others. Recently he practically co-authored an article for the Dom Post with Tracy Watkins. This isn’t good enough. 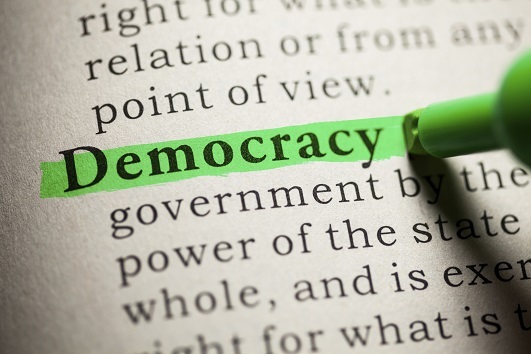 The public have a right to know whether they’re hearing an independent political analysis or being served up the recycled lines of a party hack – it’s something that goes to the very core of our democracy. Is a little disclosure too much to ask? I don’t see the media can be accused of pro-government bias when TV One breakfast described Trevor Mallard as a “dirty, dirty, dirty politician” and the New Zealand Herald has just claimed that “Democracy is Under Attack” from Labour and its friends. I suppose you are also concerned about the Herald Front page this morning – “Democracy under attack” and then Pages A4 and A5 as well. I mean who does the Herald think it is makeing the Corrupt EFB an issue beyond the beltway. I have been sensing a rise in interest over the past few weeks, and then this. I expect the EFB suddenly has become a mainstream issue. Oh dear if you thought the Orewa-1 speech hurt labour, then I can see this becoming the major news for the next three / four weeks. Expect a major drop off in support for any party supporting this corrup legislation. Complaining about media bias on the EFB issue is willful avoidance of the point that Labour is taking a chainsaw to the concept of open democracy in this country. It looks this appalling bill will be rammed through the house soon, but rest assured that the issue will kept alive though the next year, and Labour (and its poodles) will be publically attached for their actions. People will not forget this disgusting raid on democracy. As for Farrar on TV1, I suppose you think that the Labour bro’s are going to take back the Maori seats, right – happy dreams Tane. Maybe if you were a little more public with your identity you could get your face on TV1 as a political commentator on Maori issues too – would that make you happier? I hope you are going to insist on Christ Trotter stating in every interview that he got on stage and heartily sung the labour party campgaign song. Or that chris laidlaw, john tamihere when they are in the media to say they are ex labour MPs. I hear that jill pettis and dianne yates are being lined up for careers in the media, i hope they too also reveal their pasts. Are you going to comment on what the polls actually said? How is your “about” page coming along? You demand transparency from everyone else and question $20 donations to the Kill The Bill campaign but seem to be reluctant to provide the same level (or any real) information on who finances this site. Interesting to see none of your on the right have actually engaged in the issue at hand – whether DPF should be introduced as a ‘political commentator’ with no reference to his obvious bias. Dearest hypocrite – you shouldn’t waste your time on this tuppence ha’penny sfuff. Sites like The Standard cost nothing to run. You should go after the parties themselves. Why are parties so secretive with their accounts? Why don’t they publish their accounts annually and publicly? What are they hiding? Interesting to see that The Standard had not posted on the biggest political story this month, let alone addressed the underlying criticisms of the EFB. Silence on this issue is tacit support. More than tacit. So is this a genuine political blog, or just a propagandist mouthpiece for those who are trying to steal our freedom? We know who DPF does some work for from his disclosure statement. He states clearly in his about page and we can put his comments in context. Maybe the base costs of runnning the website is not much but who does Tane work for? Is this independent comment? Tane – You could’ve made a point here, although I doubt I would’ve agreed that commentators need to have their bias attached as a label every time they speak (see rjs131 above). If he was actually labeled “independent” then you may have a point, but “political commentator” makes no implication of independence. You’re the one who added that word, without any form of justification. Bendodic – So, the short answer is “yes, he should”. People can make up their own minds if the label is absent. or should we have a “State Pre-Speech Bias Assessment and Labeling Board” so no-one has to use their critical judgment anymore? Back to Tane – If David was actually on the National payroll and ‘blogging from headquarters’ then you might have a point that he should’ve been labeled as a National Party Spokesperson, but he clearly is not. His views most definitely align with National and that is the party he generally supports. However, he does say so when he disagrees with them – he does detailed posts on it. He’s no hack. Your own frequent protestations of independence would be taken more seriously if you didn’t unfairly spread lies about DPF. You can’t expect to be taken on your word about anything when you so blatantly lie about this. hypocrite, your nick is aptly chosen. Exactly the same question can be asked of anyone who choses to post anonymously. Like you (and like me of course). Being anonymous I expect to be judged as such. I have no credibility and can only be judged on the context of the comment. If I purport to post as independent political comment then there is a higher threashold of disclosure (if you want to be judged as such). For the purposes of this blog I’d say that’s pretty decent. None of them are going on the telly claiming to be non-partisan political commentators. When you read The Standard you know what you’re getting. When you see Farrar on TV his bias is hidden. Well, its hardly his fault what TVNZ puts up on the screen. Why don’t you complain to TVNZ about it – after all, it is the state broadcaster. I’m sure plenty of people will be, why do you feel the need to try and make it a non-issue on the internet? I intend to. But you’re wrong about TVNZ – it’s run independently along commercial lines. No Tane – thats a FREE MEDIA – not one that is regulated to only run the Labour party line, or point out any perceived bias that suits you and your acolytes. If you were really concerned about democracy in NZ you wouldn’t be supporting the massive travesty that Labour is proposing with the EFB and associated actions. And don’t go banging on about Brownlee, It is Labour and its supporters that are introducing these changes and ramming them through parliament. I am so pleased EFB is under attack. hypocrite- as far as a blog’s concerned these guys are more open about their positions than most. They’ve said elsewhere that most (but not all) of them are Labour Party members and it’s pretty clear that the labour movement includes the party (with trade unions being the industrial wing of the movement). It’s really no secret. But that’s not the point- you’re trying to distract from the real issue here, which is that DPF is on the telly being promoted as some kind of independent political commentator when he’s clearly not. It pains me to hear him on Larry Williams attacking Labour mercilessly without revealing his true motivations. He’s the furthest from an independent commentator that you could possibly get and it’s a disgrace. Daveo – anyone who cares, knows. DOes Chris Trotter give a lengthly disclaimer each time he’s on Radio NZ’s Panel. Does Brian Edwards. Does Matt McCarten? Sheesh, get over it already. This post is just up as a little sideshow while this blog’s authors are attempting to divert from the Heralds front page today. True, but most people who watch TV don’t care enough to do a google search of track down DPF’s disclosure page. Trotter is well known as a left-wing commentator, and I agree he and others should be introduced as such. His column in the Dom Post is called “From the Left”. I think David Farrar should have a similar disclaimer. posted by the Same Eddie that posts here? He certainly managed to push all the Labour taking points (Hollow, EB, Wealthy secret individuals) pretty well. I note that he didn’t mention that he is a Labour party stooge and blogger in the post though. Shock Horror. Imagine A lLabour partyu member not disclosing that in a public forum! Santa. Trivialise and sidetrack all you like. David Farrar is not an independent political commentator and should not be treated as such. Our media should know better. It’s that simple. A lot of diversionary tactics on this thread, but the principle is very clear, and straightforward. DPF works for the National Party. This is uncontested fact. If you can’t see the obvious conflict of interest, it can only be because you don’t want to. Nobody could be that stupid. I suspect it is shoddy, lazy journalism rather than a great conspiracy, but certainly it does not meet the basic test of broadcasting standards. Viewers are entitled to be better served. Daveo, I must have missed where they called him “independent” – can you point out where TVNZ did that? Looks more like Tane invented that that aspect. If Trotter is on the Labour payroll, as a viewer I expect to be told that important fact. Boy oh boy, don’t these Tories and thier poodles yelp and scream when thier covert funding is threatened! Is the Herald getting a little desparate? so why was my comment deleted? Farrar was probably reading from a script that had been pre-prepared for him. Don’t tell lies, rOb. The Labour Party’s financial statements have never been published. The New Zealand Labour Party is an unincorporated society. It never discloses its financial accounts. Gobsmacked – I’ve got no idea if he is paid by Labour. I can’t find a disclosure statement from him. Trotter could not be described as independent thouh, when he is on the stage, singing the party song, at the recent Labour conference. When will this blogs authors publish a similar statement on their funding? (I’ll give you a hint, when hell freezes over). They are quick to attack TVNZ (which Farrar has no control over anyway), maybe they should have a word to the new minister of broadcasting, he’d probably give TVNZ a biff. dave, your comment was not deleted. You probably entered the captcha incorrectly. Try it again. I missed the caption that said “David Farrar, Unbiased Independent Commentator Not Affiliated To Any Political Party”. But maybe it flashed by on the screen so fast I didn’t see it. I’ve also missed the bit that describes Chris Trotter as the same. Although they are both political commentators. The Labour Party does in fact disclose its financial accounts, every year at it’s conference attending delegates are given copies of the Party’s finances. Well I’m many things, Prick, but I’m not a liar. The 2007 accounts were published and handed out to everyone at the conference in Auckland last week (everyone including the media). This has been Labour’s practice for the last few years. I have a copy here in my hands, Prick. Post your address and I’ll send them to you. An apology is due, Prick. I’ll believe they ‘publish’ accounts when they are posted on the party website – like Farrar’s disclaimer is posted on his website. Handing out at a conference doesn’t really count as published. Maybe you could scan and post your copy rob? Obviously you don’t know what publishing means, r0b. Publishing means to make public by dissemination. Scan them and email to me. Hading out to the media does count as published (kinda like most press releases). Audrey Young took a copy! Post where? Post your address and I’ll send them to you. People will (or should) be aware that Labour, NZ First, Greens, Progressive, United Future and ACT are about to vote to change the law so that they can spend their parliamentary budgets on election pledge cards and the like. Even worse, the law changes works in tandem with the Electoral Finance Bill, so that all the money they spend – even if done in the week before the election – is exempt from the spending limits in the Electoral Act. So how much money are we talking about? Well from the 1st of December the parliamentary budgets available for pledge cards and the like increases to $16.2 million. Labour has less than National because they have 25 Ministers with Ministerial Offices out of which press secretaries and the like are funded. National has to fund all its non secretarial staff from its budget. Field and Copeland may not get their leadership funding until such time as they declare a party affiliation. Now I am the last person to advocate parliamentary parties shouldn’t have enough money to fund their staff and activities. But that money should not be used on promoting parties during the 90 days before an election. Under this new law, Labour and NZ First could spend their budgets on full page newspaper ads promoting themselves even after Parliament has been dissolved. And as if that isn’t bad enough, all these millions of dollars can be spent, without even counting as expenditure under the Electoral Finance Bill. Labour can now legally spend twice the $2.4 million limit. They overspent by $800,000 last time. This time they can overspend by millions and this little funding gerrymander makes it totally legal. One could have two identical brochures. One for say Labour and one for Party X which is not in Parliament. They could have the exact same text – talking about how people will be better off under their economic policies. Every word could be identical except substituting party names. But Labour’s pamphlet will be exempt from the spending limit if they spend their parliamentary budget on it (and stick a crest on), while Party X will have to count the cost of that pamphlet as part of their spending cap. Regardless of your political orientation, one should be principled enough to say this is unjust. It unfairly protects all incumbent parties and especially all incumbent Electorate MPs from competition. Nice to see you have mastered the cut and paste module of your Stotts Correspondence course dave. IP – you owe me an apology! rOb- don’t hold your breath. IP’s MO is to call anyone a liar when they say something he disagrees with. It’s because he can’t handle the idea that anyone might be smarter than him even though it’s clear he’s a punter. I’m pretty sure it’s a self-esteem thing but regardless of its basis its results are unpleasant. Oh and he never apologies except in a backhand way – he seems to think that’s a clever thing to do. I’ve just made TVNZ aware of my feelings. I do not pay a portion of my taxes to them to see a political hack on my TV screen! Yes, Tiger. I’m sure TVNZ will take it into account, and cease coverage that includes any Labour Party ministers, MPs, and supporters forthwith. Chris Trotter will also be upset with you, that you’ve caused him to lose any further political coverage. As a result of your email to TVNZ, Willie Jackson has just lost his job hosting his show. r0b, I’m still waiting for that email. TVNZ is obliged to deliver fair and balanced coverage under the charter. I really wouldn’t care if a commentator came on and praised National as long as it can be shown the commentator had no loyalties to either party. Even if Farrar came on and praised Labour I still wouldn’t want him on the news. Can you see what I’m working on? It’s the principle that matters here. Yes, I can see your principle, Tiger. You’re quite happy for socialists to go on TVNZ news and be described as “political commentators”–even for former Alliance MP Willie Jackson to host a TV show–but you can’t stand the idea of anybody from the other side expressing an opinion. To you, balance only exists as long as the other side of the debate is silenced. IP – you must have forgotten “The World According to Willie and JT”, not only a former Alliance MP, but a former Labour cabinet minister also. Poor tiger, must be boring evenings for you, although to be honest there isn’t that much to watch on TVNZ anyway. Chortle. JT’s about as Labour Party as Michael Bassett. http://www.youtube.com/watch?v=0Zj6KdJ1_1Q. Great, now the guy is going to be on National Radio. Adam – and a very fine discussion it was too. Mind you Tane is probably penning another letter of complaint as we speak. Is a little bit of disclousure on the 6 o’clock news too much to ask? http://www.youtube.com/watch?v=0Zj6KdJ1_1Q try that, if it doesn’t work just cut and paste it into your browser. Not sure if the last link is working. Chris Trotter is certainly no Labour govt puppet. Although he certainly supports a Labour govt over a National one, he is not scared to attack Labour or praise National. I remember the Budget this year where Trotter was praising Key, and saying he looked like a real leader, and challenger for the first time. DPF would never say anything like that. Also Farrar is commenting on an issue not directly affecting the Nats. However the Maori seats may be the deciding factor in next years election so this makes the his “independent” comments worse.